Think a chemical-free garden sounds like a great idea, but is too complicated to achieve? Think again! Growing your own herbs, vegetables, greens and fruit is great for your body, mind and spirit. You probably already know that gardening is a wonderful way to get outside and get plenty of fresh air and sunshine. However, too many gardeners rely on harsh pesticides, herbicides, fungicides and chemical fertilizers to help their garden grow. Not only is this unnecessary – it is also unhealthy. All those nutritious veggies pack a much healthier punch if they’re sans harmful chemicals! Step #1 – Prepare Your Soil. Your soil is the foundation of your garden, so you need to make sure it’s full of the right nutrients to feed your plants. Adding organic material like compost is a great way to amend your soil. You might also want to have your soil tested to determine its pH. The proper soil conditions can make the difference between a sparse crop and award-winning vegetables. Step #2 – Choose Your Crops. Next, decide what you are going to grow in your garden. Then, decide if you want to purchase plants or start your garden from seeds. If you start early enough, you can save some money and start with seeds. If not, you can often find plants grown without chemicals for sale at your local nursery. Step #3 – Organize Your Garden. Did you know some plants naturally protect other plants from disease and pests? It’s true. For example, Marigolds drive bugs away and if you plant them around the perimeter of your garden, they’ll help protect your herbs, greens and veggies. Before transferring your plants into your garden, figure out where you’re going to plant them. Make sure there is plenty of room between plants so they have room to grow and thrive. A tiny tomato plant can grow several feet high and several feet wide. Leave lots of room for your new friends to reach their full potential! Step #4 – Choose Natural Pesticides, Herbicides and Fungicides. 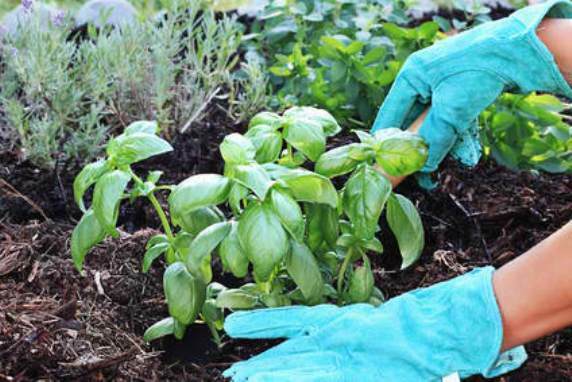 Some say that home gardeners use more chemicals on their gardens than farmers do. That’s a lot of chemicals! Interestingly enough, mild detergent and water protect many plants from harmful pests. Hot pepper sprays also works to fend off pests. And natural predators like frogs, toads and ladybugs can keep your garden healthy and full. Step #5 – Maintenance. Of course, regular watering and weeding will be required until it’s time to harvest. Take care to not over-water. Soil should be moist, but not soaking wet. Weed on a regular basis to make sure your plants get all the nutrients they need and have plenty of room to grow. Organic gardening isn’t difficult when you start with a healthy foundation. Before you dive in and start a garden large enough to feed an army, choose a few plants you know your family will enjoy. The key is to pick a starting point and get going!